The city of Orlando has its eye on being the pinnacle of sustainability in the southeastern United States. Mayor Buddy Dyer has set the goal for the city to run on 100% renewable energy by 2050; to be zero-waste with a recycling rate above 34% by 2040; and is participating in Florida’s Long Range Transportation plan, set for completion by 2040. More visibly, however, the city of Orlando wants to increase its canopy coverage to 40% by the year 2040, and the city needs help. 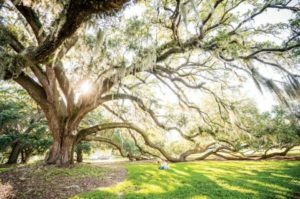 According to the city of Orlando’s website, if every resident of Orlando planted a tree, the city’s canopy would increase from 25% to 40%, which is roughly equivalent to taking 40,000 cars off of the road. This would amount to around 250,000 new trees from the initial 25% canopy coverage. In order to accomplish this, the city is enlisting the help of it’s residents. Orlando citizens can go online to energysavingtrees.arborday.org and sign up for a free tree to be delivered to their home. The website boasts that three to four trees placed strategically in a yard can decrease individual summer cooling costs by 30%, effectively dropping a $100 electricity bill to $70. Though there are several different types of native Floridian trees that the city offers (Red Maple, Bald Cypress, Nuttall Oak, Live Oak, Tea Olive, Persimmon, and Pomegranate), due to demand, only Live Oak and Bald Cypress trees are still available at this time on the website. Further, in an effort to make the process as simple and comprehensive as possible, there is a tool on the website that helps to choose a specific spot for the tree to be planted that would avoid power lines and maximize shade in order to reduce cooling costs. Once the tree is planted, there are also detailed care instructions for each type of tree online. For non-Orlando residents that are still looking to cut costs, another alternative is available. Online at https://fleetfarming.org/edible-landscapes/ anyone can go online a schedule a consultation for edible landscaping or food forests. With an edible landscape or a food forest, one is able to grow fruit trees and other food-bearing plants that would help to cut individual food costs while simultaneously making effective use of lawn space. 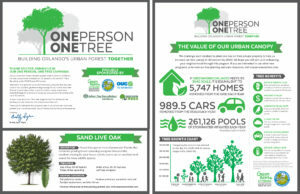 To learn more about Orlando’s One Person, One Tree program please visit the sources below.